Fine star sapphires and star rubies in large sizes have always been sought after by connoisseurs and collectors. The finest examples are the highlights of museum collections, such as the 563 ct Star of India in the American Museum of Natural History in New York. This grayish blue star sapphire, believed to be mined in Sri Lanka about 300 years ago, was acquired by J.P. Morgan and donated to the Museum in 1900. 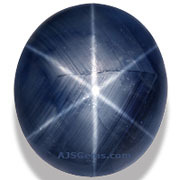 The rarity of a star sapphire is a function of its size, the distinctness of the star, its body color, and its translucency. Most star sapphires are opaque and are blue, gray or black in color. Yellow, orange and green star sapphires are especially rare, and high quality specimens in large sizes, especially translucent ones, are almost unknown. Earlier this year we had the opportunity to acquire an exceptional yellow star sapphire from Sri Lanka. In addition to its rare color, it has all the characteristics of a world-class stone -- a strong and well-defined star, excellent translucency and unusual size: 75.43 carats. This extraordinary gem had been in the possession of a Gujarati family in India for nearly 200 years. The story is they kept it in a family shrine, since yellow sapphire has a special place in Vedic astrology, where it is associated with Jupiter, the largest planet in the solar system. They recognized that a yellow sapphire displaying a star was exceptionally rare, and they called the gem The Star of Jupiter. We had this star sapphire tested by American Gemological Laboratories (AGL) in New York. It was certified as natural and unheated, with origin identified as Ceylon (Sri Lanka). The report graded the quality of star as "very good" and the strength of the star as "strong." We can't say for certain that this is the largest high quality yellow star sapphire in the world, but we have yet to find a comparable stone in any collection. This month we feature fine star sapphire and ruby, with gems representing the 5 most typical sources for these rare stones: Sri Lanka, Burma, Madagascar, Thailand and Vietnam. 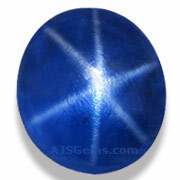 A top grade royal blue Ceylon sapphire with an excellent star and very good translucency. Certified by GRS as natural and unheated. This exceptional gem is also available set in a platinum ring with 2 significant diamonds. While Sri Lanka and Burma are the traditional sources for fine sapphire, important deposits were found in Madagascar in the 1990's. The Madagascar star sapphires tend to be opaque with a deep blue body color and clear stars. The black star sapphires with the gold star are found only in Thailand, mainly in Chanthaburi province. High quality pieces in large sizes are now very hard to find. 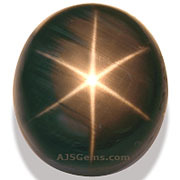 This 24.51 ct gem has a uniform body color with a strong and clear star. Completely natural and unheated. Ruby is rarer than sapphire, and the same is true of star ruby. 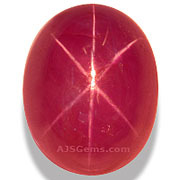 The most recent find of star ruby was in Vietnam and this 17.08 ct specimen is an excellent example. 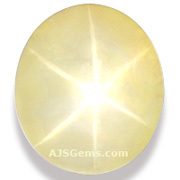 This is unheated material, semi-translucent, with a clear and well-centered star. After President Obama's historic visit to Burma on Nov 19th, we expected an announcement lifting sanctions on the import of Burmese goods. We did get such an announcement from the US State and Treasury departments, but ruby and jadeite were not on the list of Burmese products now allowed into the US. The reason, as we understand it, is that sanctions were lifted by executive order of the president, but lifting the ban on ruby and jadeite will require an act of Congress, due to legislation enacted in 2008. We are now waiting for Congress to act so that US gem collectors and dealers can once again import Burmese ruby and jadeite. Rare gems continue to draw top prices at auction. At Christie's, the 76.02 ct Archduke Joseph Diamond was sold for an amazing $21.5 million. A 62.46 ct Burmese ruby and diamond necklace sold for $5.2 million. At Sotheby's, a top flawless 10.48 ct fancy deep blue diamond sold for $10.86 million to Lawrence Graff. Christie's will auction a super rare 3.15 ct reddish-orange diamond on Dec 7th in New York, the largest red diamond ever offered at auction. Rhodochrosite is a manganese carbonate, usually found in silver mines. The color ranges from orange-pink to red. The most famous material comes from the Sweet Home Mine in Colorado. High quality mineral specimens are popular with collectors, and translucent pieces make attractive gemstones. It is quite a soft material, however (around 4 on the Mohs' scale), so it is most suitable for pendants and occasional wear rings. For more information, see our article on Rhodochrosite Gems from Colorado. The 11.55 ct red imperial topaz was one of the rarest gems we've ever had in our collection. It was sold to a private collector just last month. However, we have consolidated all the information about the gem, including photos, video and the Gubelin Gem Labs certificate, in this article on the Rare Red Imperial Topaz.